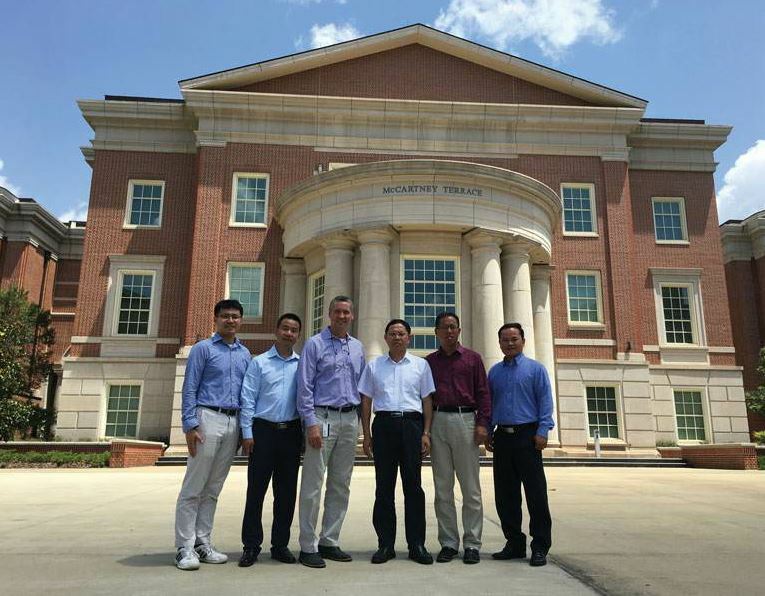 Employees of SINYUE visited Auburn University on a campus tour. From left, NCAT Postdoctoral Researcher Fan Gu, Sinyue Senior Advisor Bin Wang, NCAT Director Randy West, Sinyue President Shuihui Wu, Sinyue Senior Advisor James Luo, and NCAT Associate Research Professor Nam Tran. The National Center for Asphalt Technology (NCAT) and Jiangsu Sinyue Asphalt Co. of China have established a 10-year research and development agreement focused on advancing cost-effective and sustainable asphalt pavement practices in China and throughout the world. NCAT researchers will provide technical support in developing innovative asphalt technologies, training programs, and workshops to foster technological advancements involving high percentages of reclaimed asphalt pavement, cold asphalt recycling, highly modified asphalt binders, and asphalt pavement preventive maintenance and rehabilitation. SINYUE will finance the program, which will include building a new facility in Jiangsu Province and purchasing new testing equipment. In turn, NCAT engineers will travel to China for up to three months each year to provide leadership and technical expertise, while SINYUE employees will receive training each year at the NCAT facility in Auburn. SINYUE is a leading comprehensive asphalt company in China with business operations in asphalt transport and storage, trade, liquid asphalt products manufacturing, mixture production and paving. In the past decade, the company has actively cooperated with a number of companies, research institutions, and universities to complete pavement construction projects and to develop innovative asphalt products and paving technologies.